A great deal that has been written about Irish culture in the period ad 600-850 has been touched by the Romantic views of the 19th century, which saw Ireland as a lone beacon of knowledge shining out during Europe's 'Dark Ages'. That view has been most recently expounded in the book by Thomas Cahill, How Ireland saved civilization (1995), which proposed to demonstrate how 'the great heritage of western civilization ... would have been utterly lost were it not for the holy men and women of the unconquered Ireland'. It is a curious fact, however, that scholarly research on this topic has been conducted almost exclusively outside Ireland. Our current knowledge of Hiberno-Latin and Hiberno-Greek (and also the medieval Irish knowledge of Hebrew) is derived from the work of scholars in continental European countries, as well as Canada and the United States. While this is a very positive affirmation of the importance that such research is felt to have in these countries, it is nevertheless extraordinary that research of this kind on this subject has been almost entirely neglected in this country. These Projects will seek to establish a platform on which native scholarship can match that of our colleagues abroad. The image on the right is from the ‘Reichenau Schoolbook’, which is the notebook of a ninth-century Irish scholar studying in Carolingian Francia. The narrow column down the left of this page shows Greek-Latin paradigms. The main block of text contains notes on the seven modes of hypothetical syllogisms, below which is a short passage from a treatise on the sphere. 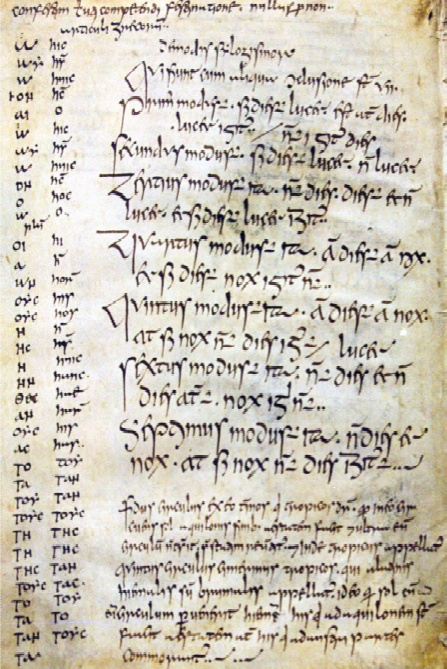 The manuscript is now in Austria, at the Stiftsarchiv of St Paul in Carinthia.